Whilst fusion cuisine is a well-established concept, the particular fusion offered by Zela seems to be one-of-a-kind. The brainchild of a trio of rich, famous and successful men; Cristiano Ronaldo, Rafael Nadal, and Enrique Iglesias, Zela Restaurant joins the stable of the Mabel Hospitality Group. Situated within the Me Hotel on Aldwych, it’s in a great place for the theatres and nightlife of London’s West End. The space at Zela Restaurant is decorated in pretty shades of green and teal, with comfortable cushioned alcoves decorated with lush greenery and gold butterflies. It manages to stay just on the right side of kitsch; any more and it could have started to resemble the Rainforest Café. The tables aren’t too close together, so although it’s a fairly big space, it feels intimate. I hadn’t intended on blending in, but my green dress went rather nicely with the décor! Whilst we contemplated the menu we chose a couple of cocktails, I had a Margherita Sichimi; made with Tequila, Cointreau, Grapefruit and Chipotle syrup it came served with some creamy guacamole and pretty chips which I suspect came from the Japanese side of the cuisine. My companion’s cocktail made both of us AND the waiter laugh. 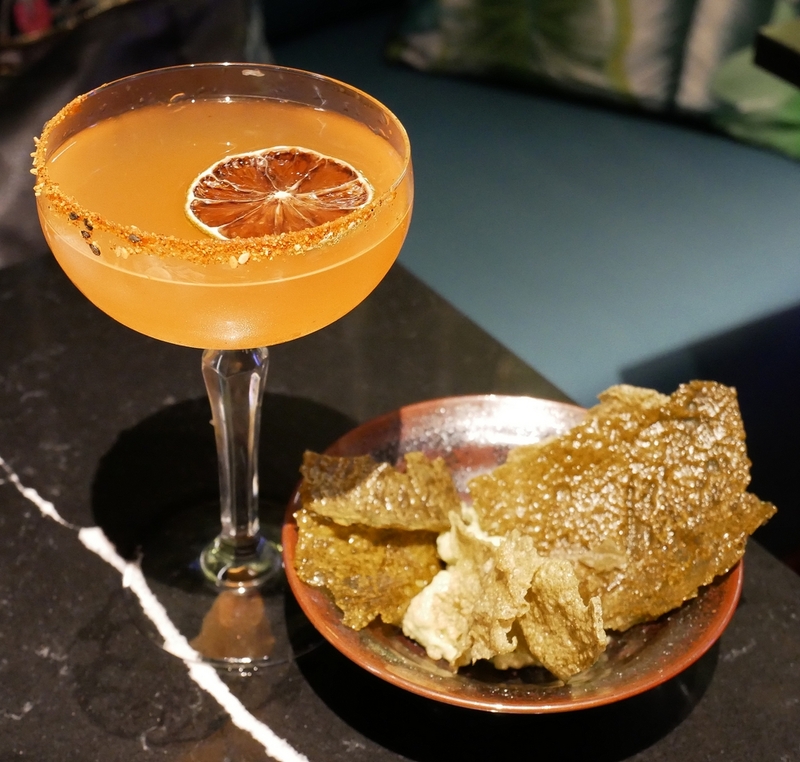 The Chikara was made with Bourbon, Ginger liqueur, Peter Heering, Ginger beer and Orange bitter. A glass arrived complete with a large lump of ice, and the then the smoking gun was used to pour the cocktail. Rather bizarrely the craft beer that my companion later enjoyed came in a Heineken glass, which caused him some anxiety and the waiter to have to double check that the right beer had been served. He’s rather a beer aficionado, and it’s equivalent to a glass of Krug being served in a Babycham glass. 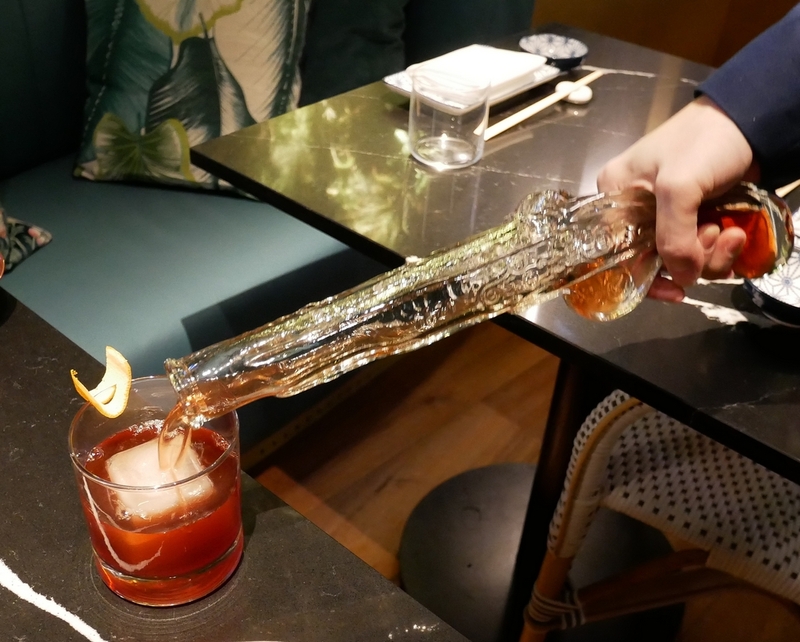 It seemed to us to be a bit of a mismatch between the sourcing of the rather OTT cocktail accessories and a lack of standard bar glassware. We put ourselves into the waiter’s hands and asked him to bring us a selection of dishes that he recommended. The food is meant to be shared, so this was a really lovely way of getting to try a good cross section of dishes. So what exactly is MEPPON? According to Zela Restaurant, this cuisine, (the name is a portmanteau of Mediterranean and Nippon) is a blend of Japanese techniques with Mediterranean ingredients. 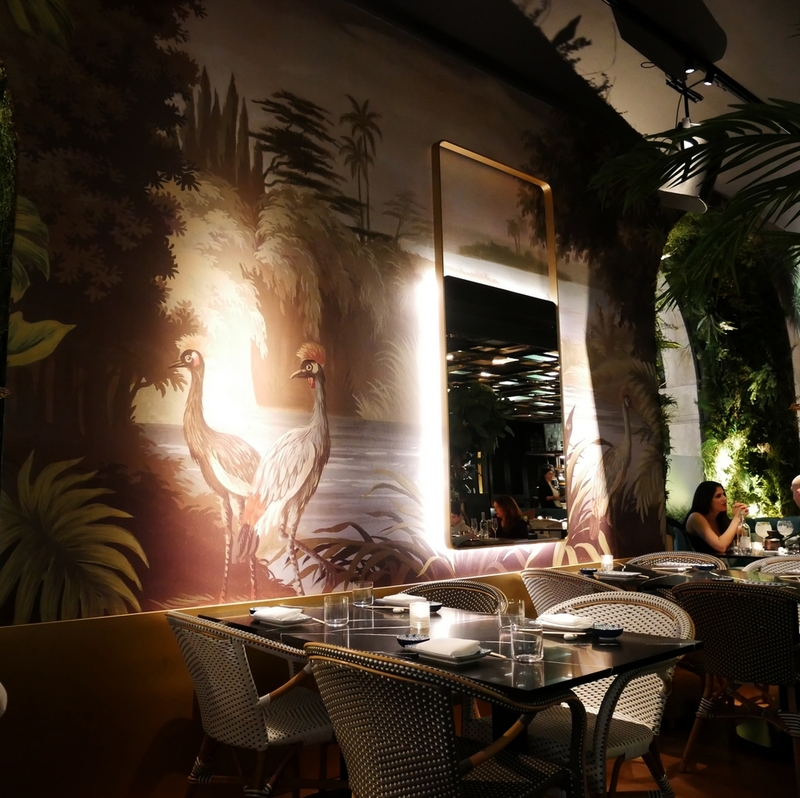 It was created by Ricardo Sanz, the Spanish chef who is Zela’s gastronomic director. We really didn’t know what to expect. I was hoping for a combination of beautiful fish from the Japanese side, with fresh vegetables and seasonings from the Mediterranean side of the fusion. 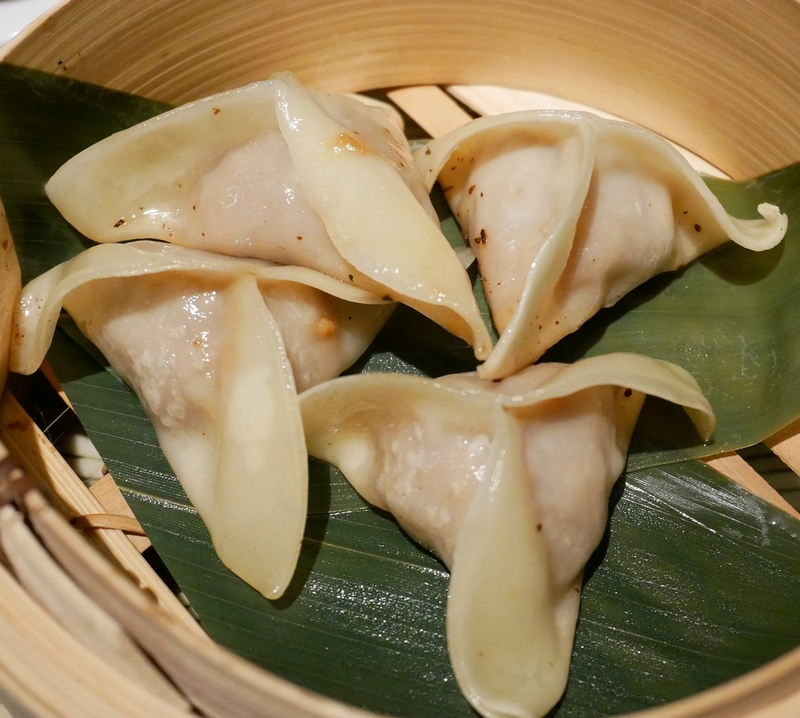 Our first fusion dish of steamed shrimp “al ajillo” gyozas from the starters section of the menu arrived swiftly. Prawns in hot garlic oil are to be found everywhere in Spain, and to be honest, it’s a dish that I normally find to be a bit brutal. In this case, the shrimp within the gyozas seemed to have been gently marinated and the garlic was added with a light touch. 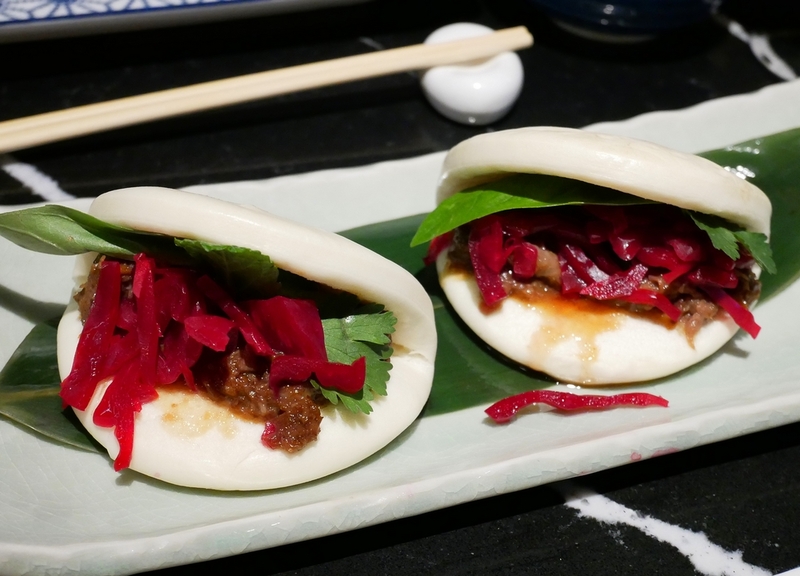 Our Oxtail Bao were tender and full of flavour with the pickled cabbage giving a lovely crunchy contrast. 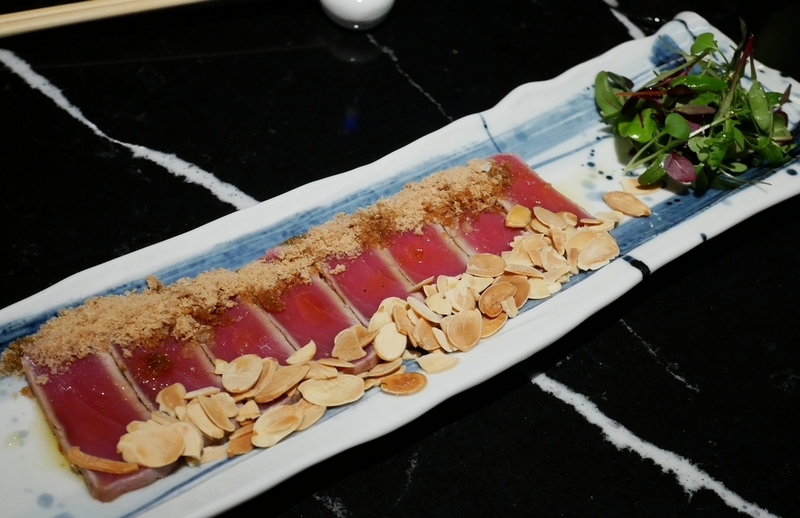 Our next dish again contained a Spanish fusion element with toasted almonds and Mojama (dried salted tuna). 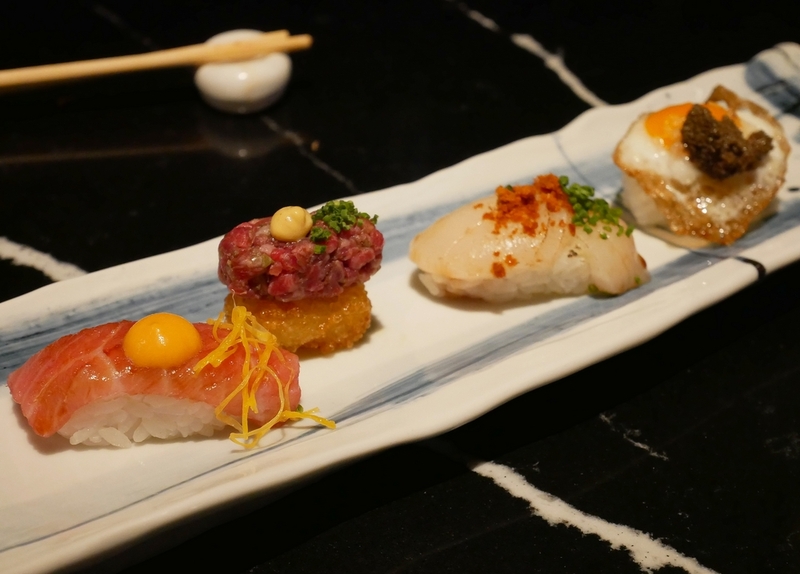 The quality of the tuna was fantastic, the addition of the other elements was nice as they added crunch to the otherwise melt-in-the-mouth fish. But it didn’t really need those elements if that makes sense? 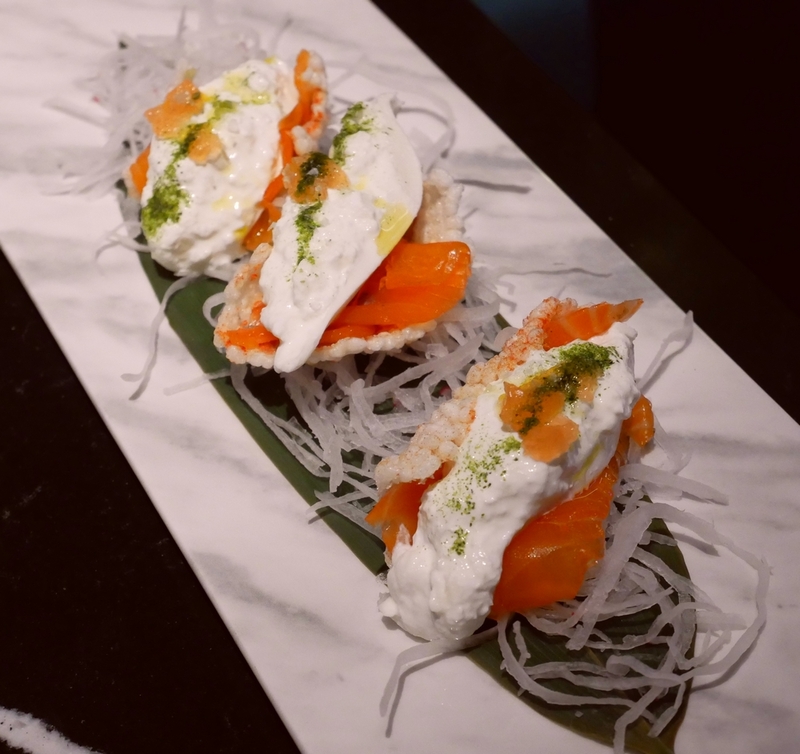 Our next dish took us to Italy, with smoked salmon and creamy burrata on top of a form of puffed rice. This reminded me of cream cheese and smoked salmon. It was a dish that needed more flavour, perhaps more of that basil oil, and less of the burrata. Our waiter had chosen a selection of Nigiri for us. These included a steak tartare, scallop with Ibicencan Sobrasada (a sausage from the Balearics), and quail’s egg with truffles. I particularly liked the steak tartare with the slightly crispy rice base. My companion thought that the egg and truffle came together well as a dish especially nicely. After a short break, we moved on mains. 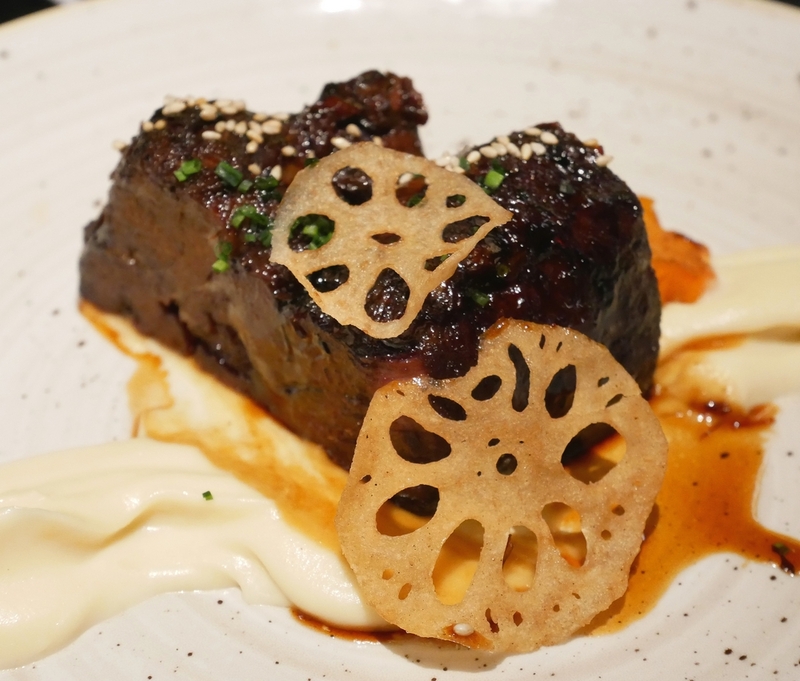 The Wagyu teriyaki was so tender that we were able to cut it with chopsticks, it was full of flavour too. One of the best dishes of the evening. The other main dish we shared was black cod, cooked to perfection, which flaked beautifully. In Italy again in terms of flavours, with the addition of the kabocha gnocchi, which to be honest felt too stodgy to go with this delicate fish. 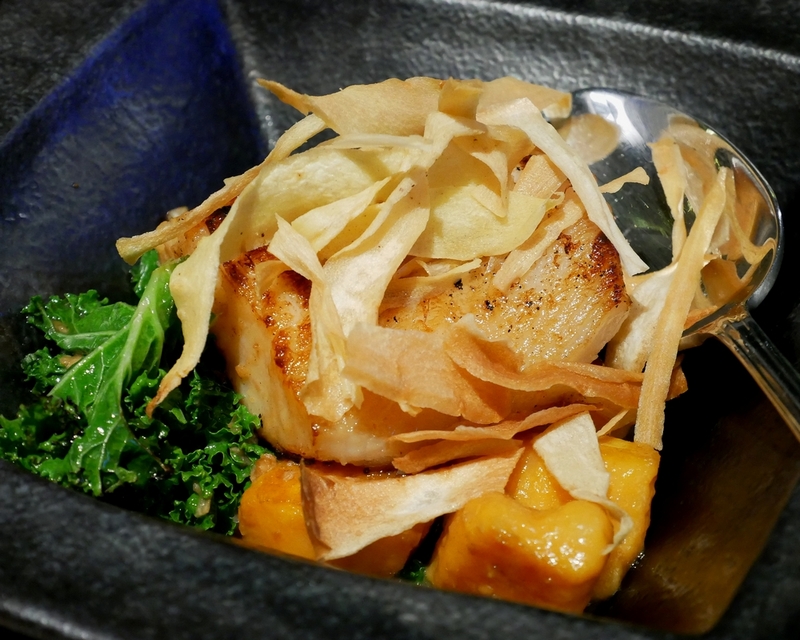 We did enjoy the slivers of crispy parsnip atop the cod. 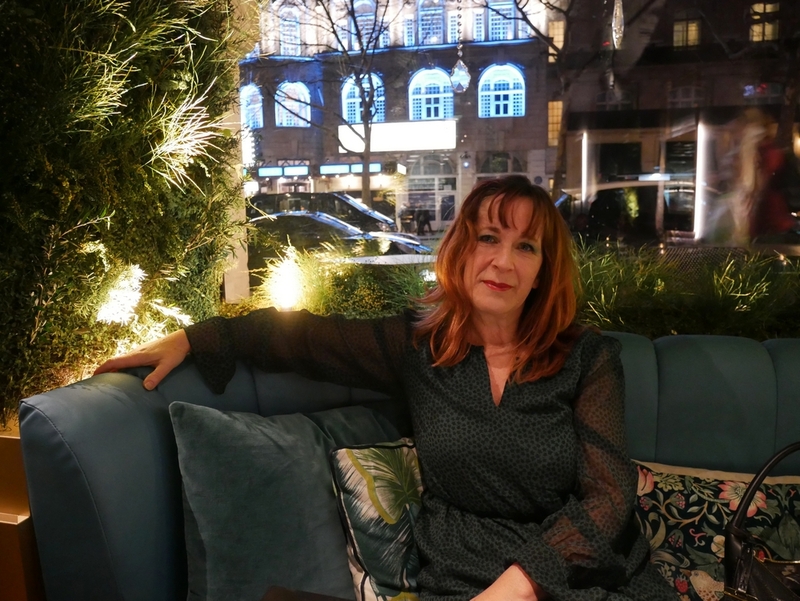 Throughout the evening there was DJ in the background playing remixed versions of old favourites such “I’m every woman”, “Bad Girls”, and a few from Jungle. 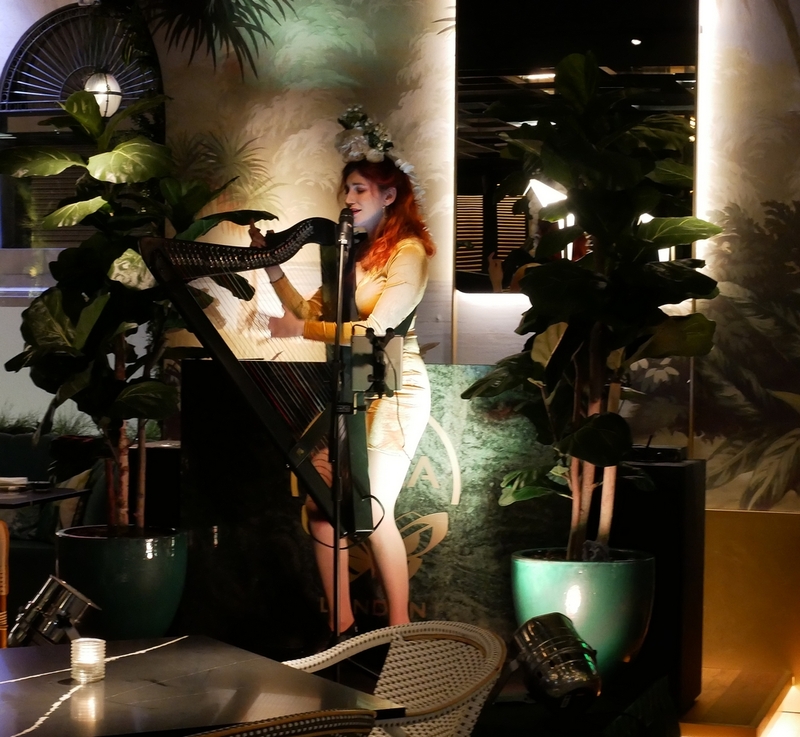 She was briefly replaced by a woman with a floral arrangement on her head and an electronic harp. She played and sang a few classics such as “Wicked Game”. It was frankly, a bit bizarre, and unexpected to say the least! We left having eaten loads, not feeling overly full, which was rather nice. I did feel as if I’d eaten some beautifully prepared food, cooked with a light touch. The service throughout was attentive, good-humoured and patient with all our and other customers questions. It’s worth saying that there is also a pre-theatre set menu for £27, which gives a good selection of dishes to try. Definitely worth considering if you looking to explore and stretch your boundaries a little. Disclaimer: We were guests of Zela. All editorial content and photos are our own.